Home » Cyrus II of Persia on the Battle Field. Born around 590 BC to 580 BC; died August 530 BC. Asia Tempi Antichi. Persia. 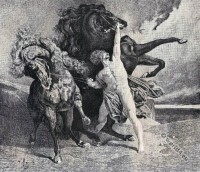 Ciro sul campo di Battaglia. Cyrus II often called Cyrus the Great, son of Cambyses I, ruled Persia from about 559 BC. to 530 BC. as the sixth king of the Achaemenid dynasty. Soon after his death the Persian king was transfigured by his people as an ideal king. This positive attitude has been adopted by the Greeks, strengthened by his portrayal in the Bible as religious tolerant Regent and still dominates its assessment. The oldest sources about Cyrus are written in cuneiform. The Cyrus Cylinder found in Ur in 1850, and a four-line brick inscription was written by the Persian king himself. From the ancient Greek writers is Herodotus the historian who narrated the earliest representation about one hundred years after Cyrus, which is also completely preserved. 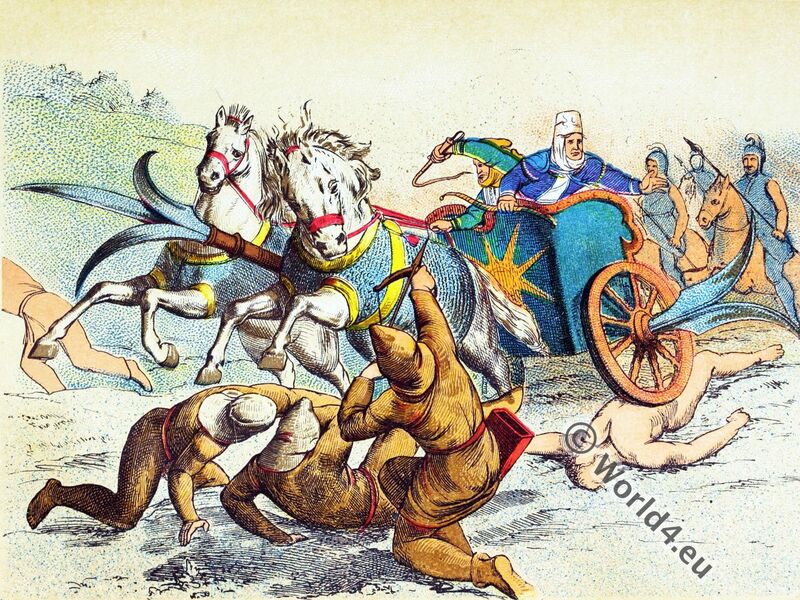 In the here depicted battle scene Cyrus is shown on one of the feared scythed chariots of the Persian army. Tomb of Cyrus the Great. Source: Usi e Costumi. Antichi e Moderni di Tutti Popoli del Mondo. Narrati e descritti da L. Bellinzoni. Editore Perino. Roma, 1900. 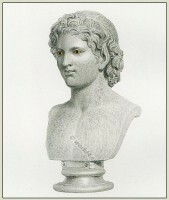 Bust of beardless Satyr. 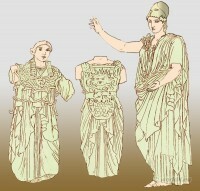 Greek sculpture. This entry was posted in Ancient, Asia, Military, Nobility, Persia and tagged Ancient persian clothing, Usi e Costumi on 8/23/16 by world4.